Now that’s mojo right there, friends. Upside down, arms up (or down, depending on how you look at it), smile at the ready. Did I mention his fear of heights? Yes, before this shot, No. 1 son was still one to avoid stairs without backing and escalators that rose too high. 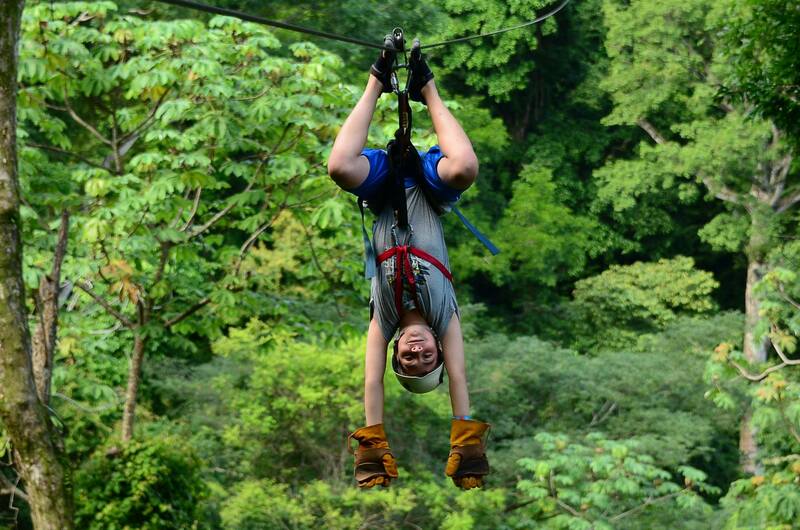 Was it an adventure trip to Costa Rica that made the difference? By the time he got to this point, hanging upside down thousands of feet up a Costa Rican rainforest mountain, he was so out of his normal element that trusting in providence, life, the moment—seemed a natural choice. I like to call it wild abandon. Abandon has gotten a bad rap through the years. Touted in literature as the poor choice of women who fall into ill repute, men who gamble their fortunes away, families who fall to ruin—abandon is seen as reckless, feckless, the choice of the weak-willed. Not a character flaw or a lack. A choice. Do you see the look on his face, folks? He is giving himself over to cruising upside down on a tiny line high above beauty like he had never seen, trusting in the life force that got him there and will get him across the chasm over which he hangs. I love it when my kids best me. A ninny from birth, when I see fearlessness in them, I applaud. I cry sometimes, too, truth be told. I love that I am not passing on my own weaknesses to them. When was the last time you gave yourself over to anything unrestrainedly? Remember in first grade when the teacher asked who could draw like Picasso? A thousand hands went up instantaneously. We don’t do that anymore, do we? There is no abandon in our response; it is tempered. 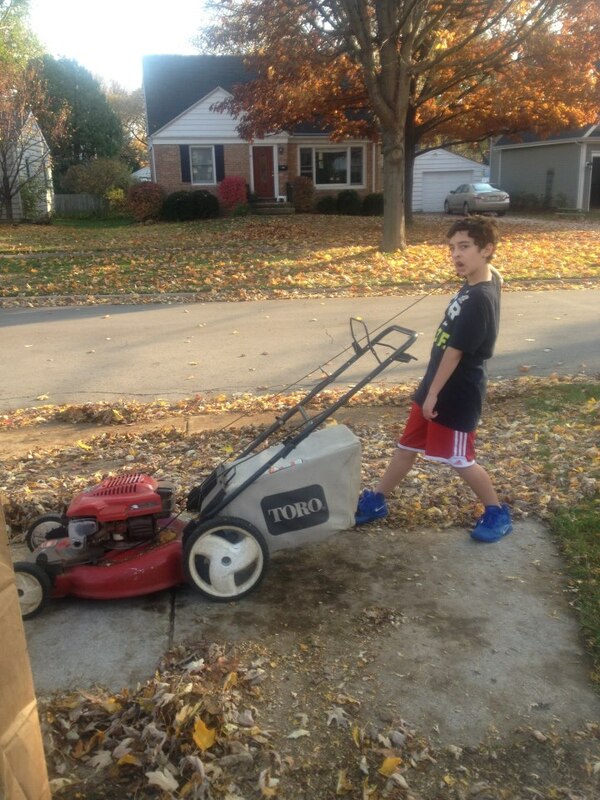 Look at the face of the boy pushing that mower for the first time. It says, “Like a boss.” Abandon makes it so. You see abandon on faces of parents with children on roller coasters, dancers lost in the dance, teens ziplining over a crevasse in Costa Rica. I wish to see it on the faces of my coworkers, inspired to create something that has not been done before. On teachers’ faces when they wax eloquent and passionate about whatever turns them on—chemistry, drama, history. On a lover’s face when he tells me how much I mean to him. On a child’s face when attempting to ride that bike without training wheels, polish off that ice cream cone, win the sack race. I do not believe abandon has abandoned any of us. I think it awaits. We cannot summon it by will, but rather only by putting ourselves so out of our element that we forget the concept of a self. We are one with the world, with the ride, with the dance, with the passion. Abandon awaits us, friend. Let go with both hands and enjoy the ride. This post and the couple preceding it are my answer to a challenge by elizabeth2560, who writes the blog Almost Spring. An honest, thoughtful blogger, she challenged me to write five posts based on photographs. This is my third. I’ve not done it in five days, as she asked, but am hoping wild abandon takes over and we fly through the rest. You are speaking to choir, I’ve been chasing after abandon all my life and it seems that I’ve finally caught up with it at long last! Love, love, love this post. One of my greatest challenges has been/is to not transfer my own fears to my children. My kids are sensitive and impressionable, and they pick up so quickly on what I am feeling. I want them to live with abandon and not be hindered and held back by their mother’s worries. I want them to live with wild abandon. I want to live with wild abandon. Great photo/writing assignment idea, too! I’m right there with you, Karen. No need to visit our “stuff” on them, right? Here’s to raising safe daredevils, if there is such a thing:). Great post. I think most of us have forgotten the child within. Life has become way too serious! Well put, as always, Kay. Even your column on abandon is well-thought. 🙂 Nowt that’s a compliment. There’s something freeing in abandon. Your son looks happy. My kids are usually physically braver than me (roller coasters, higher dives, etc.) but that’s not saying anything because I’m pretty wimpy. I’d actually like to try zip-lining, though. To go whizzing over the rain forest sounds awesome. You should try ziplining! If I can do it, anyone can:). Was such an adrenaline rush and after a while, believe it or not, relaxing. I saw that look on the face of my little grand-daughter recently when the family went for a bush-walk in the rainforest. Hardly the same as hanging upside down in the jungle but she knew it was big-people stuff and a bit bold and daring for a two-year-old. Her excited look as she began the walk is imprinted on my memory. I am glad that you took the challenge up. Thanks for the mention. This is a lovely post; and huge kudos to your son for being so brave. I think it’s one of the blessings of parenthood that our kids make us braver because we will fight for them and protect them and ride with them on things that we’ve been trained not to do for ourselves. My mother over-protected and instilled fear in my brothers and I, and it’s been a huge battle for me to embrace abandon, and both give my son space to be brave and be brave with him. Cheers, Su. Loved this, Krisse! Thank you for sharing & inspiring!! I’m so glad it struck you! Love it when kismet puts us in right time and place:). Thanks for stopping by. I love this post. It comes at a good time for me, having woken up in the middle of the night wondering if and how I could jump back into my life and relationships with abandon. You’re so right. It’s a choice. Thank you!